Distortion-free image is equal to plate glass mirrors. Shatterproof “glassless" mirrors cannot crack, shatter or chip but can be punctured. 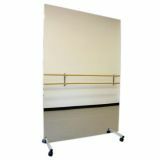 Lightweight mirrors can be securely mounted to a wall or ceiling surface with just a small piece of self-adhesive velcro.